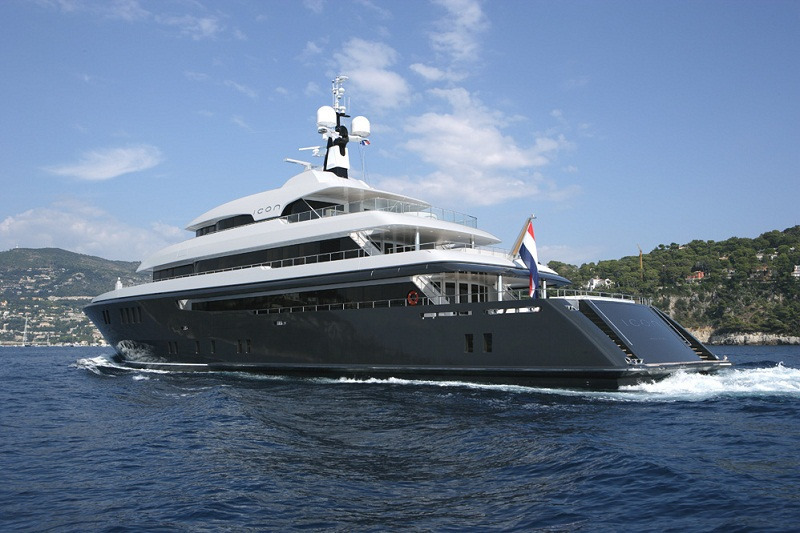 The 68m superyacht ICON (ex ICON 62) is a custom-built charter yacht, originally launched by the prominent Dutch shipyard Icon Yachts in 2009. 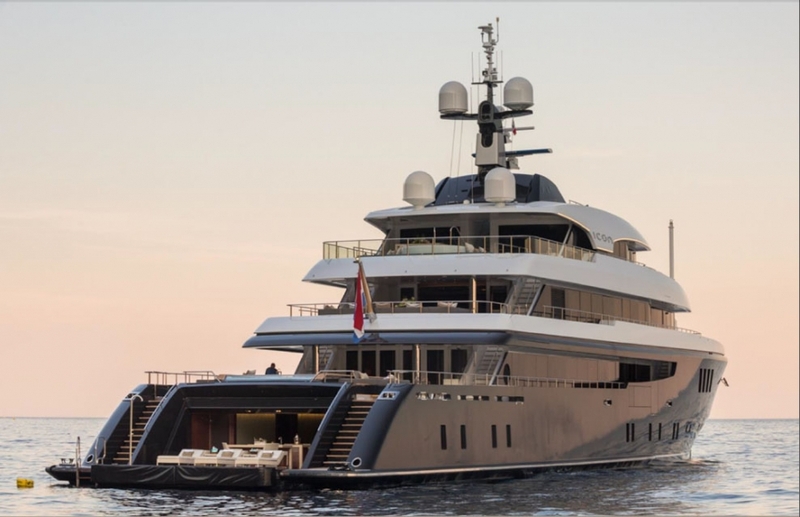 She undertook a five-meter transom extension to an overall length of 68 meters in 2014, performed by her home yard, in partnership with Evan K. Marshall. 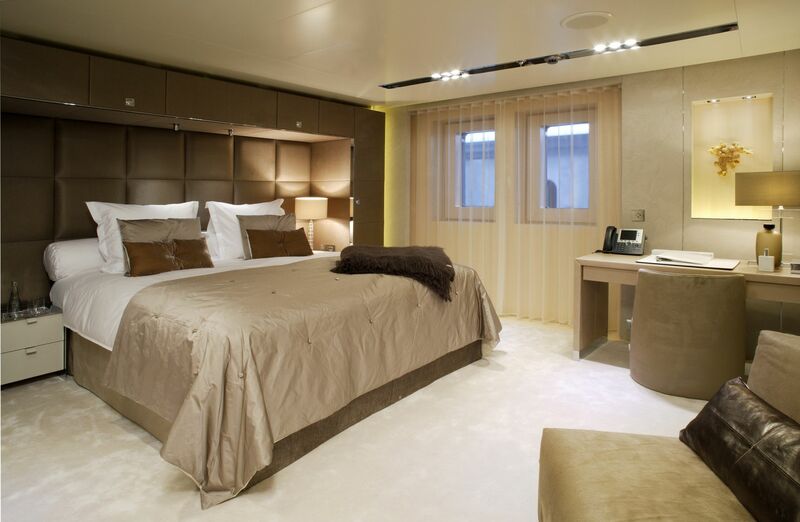 Accommodation is provided for a total of 12 charter guests in 6 staterooms. 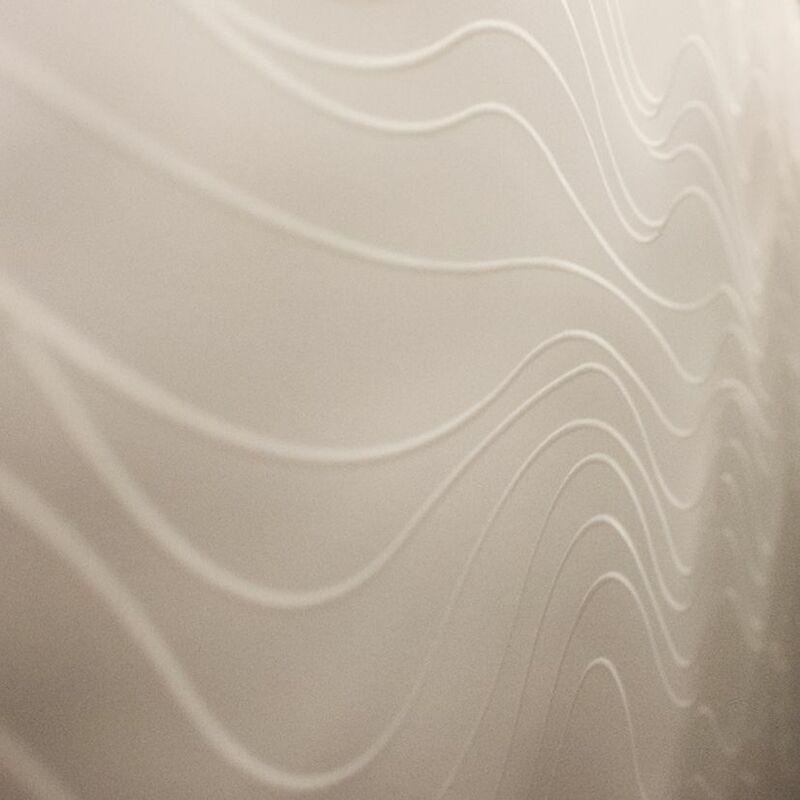 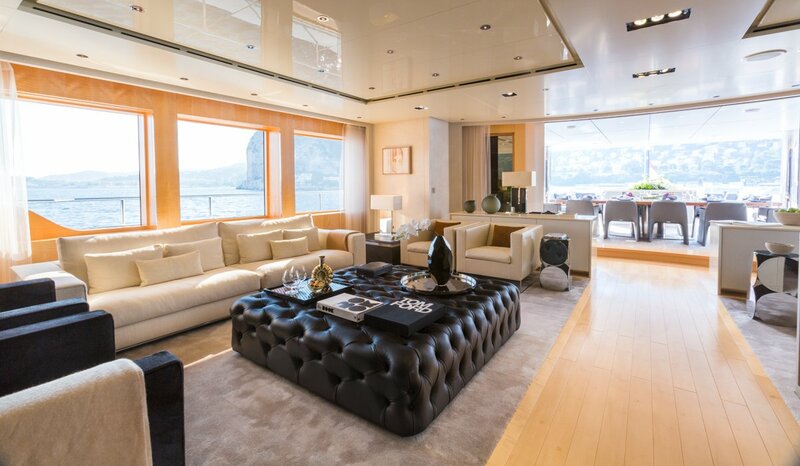 ICON yacht's interior styling is done by Redman Whiteley Dixon, with the interior design being a work of the renowned Studio Linse. 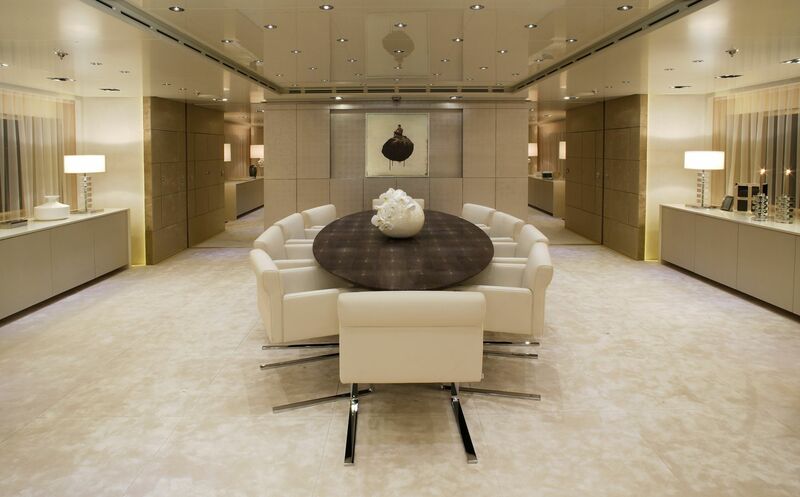 The decor is timeless, elegant and neutral. 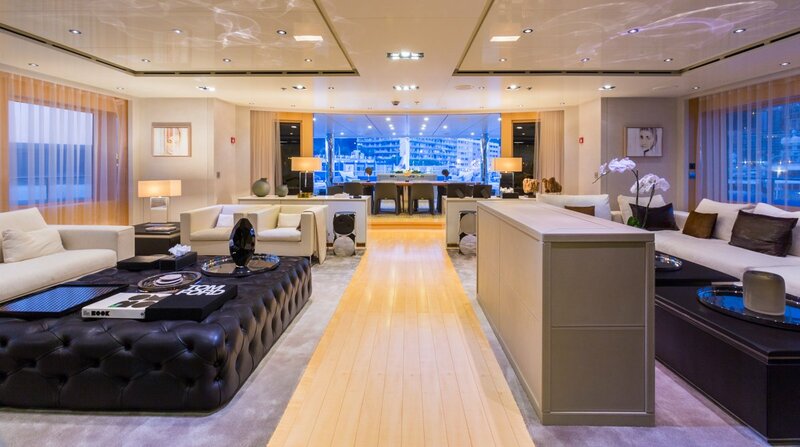 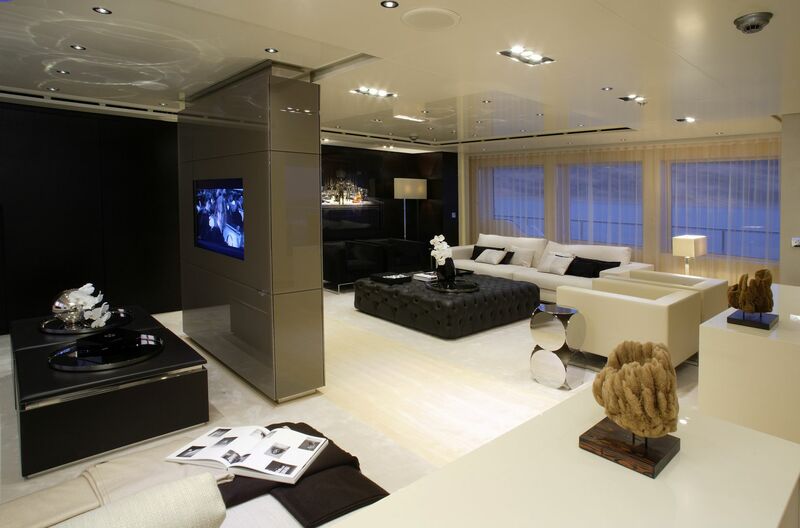 A sumptuous salon lounge on the main deck offers plush seating, set in a social atmosphere surrounding a large coffee table and the latest in entertainment; further aft is the formal dining easily accompanying up to 10 guests. 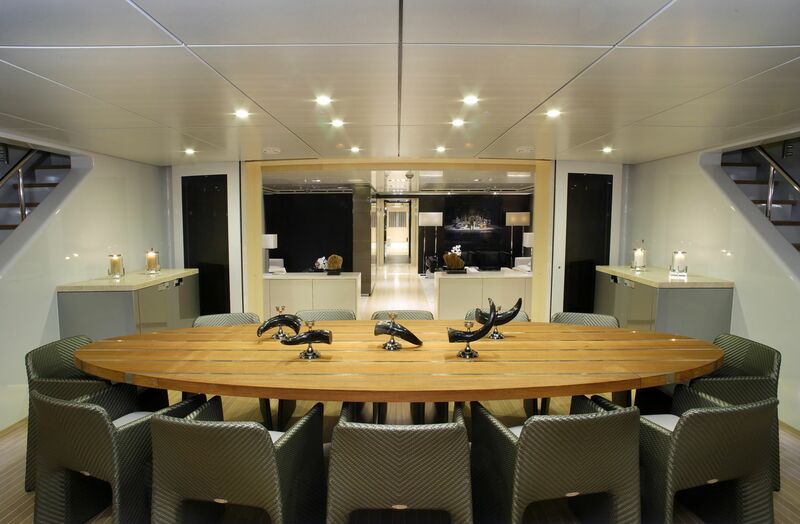 She boasts panoramic windows which provide great natural light and stunning views from the salon and dining area. 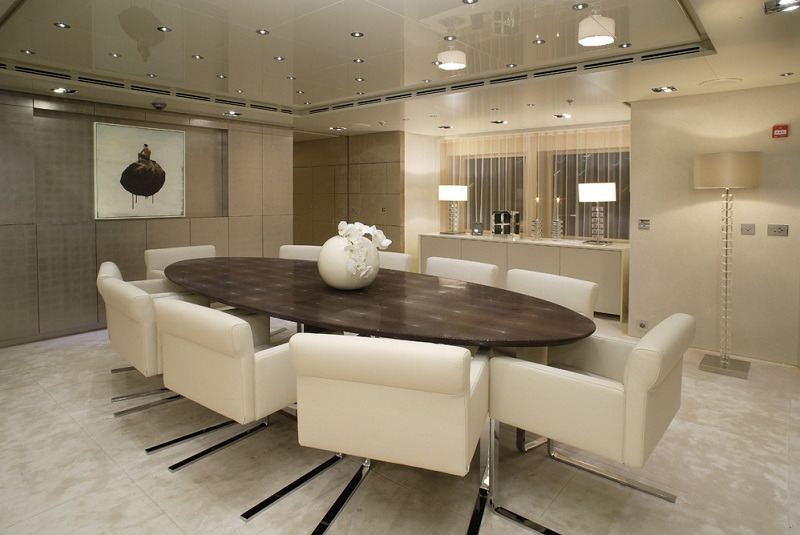 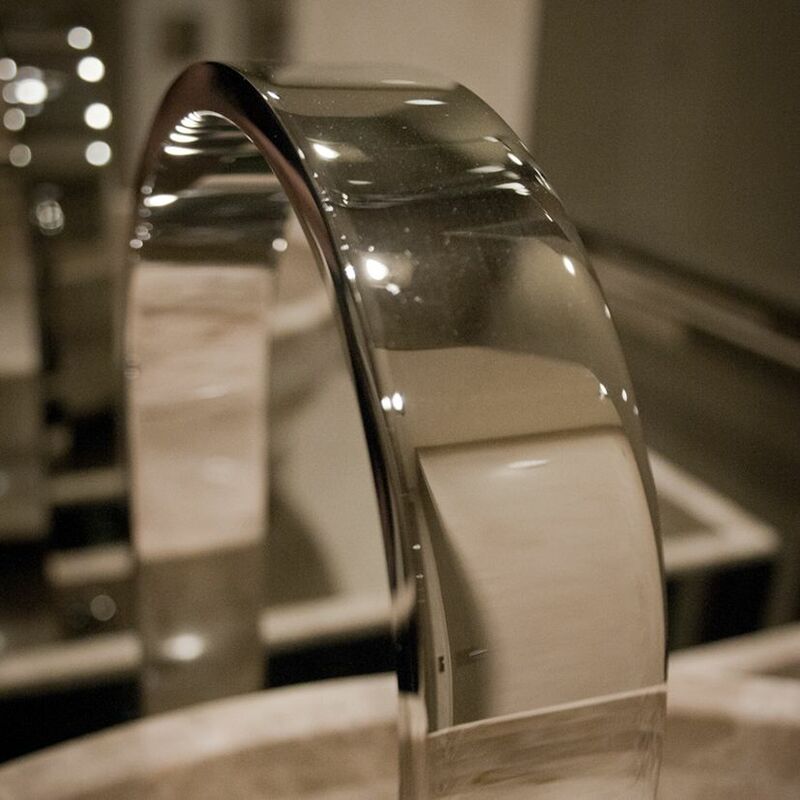 Soft lighting and bespoke finishes create a sophisticated feel, perfect for every occasion. 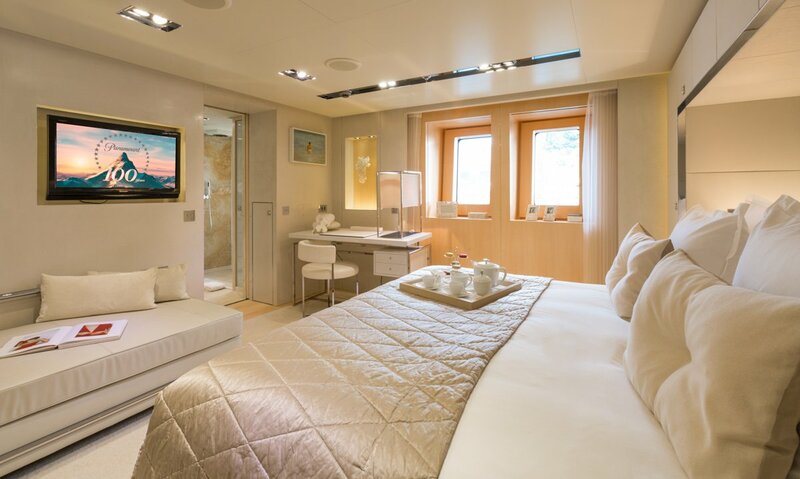 On the main deck forward is the master stateroom, boasting a full beam layout, king size bed, easy access to the upper observation lounge and study and large ensuite with luxurious custom tub. 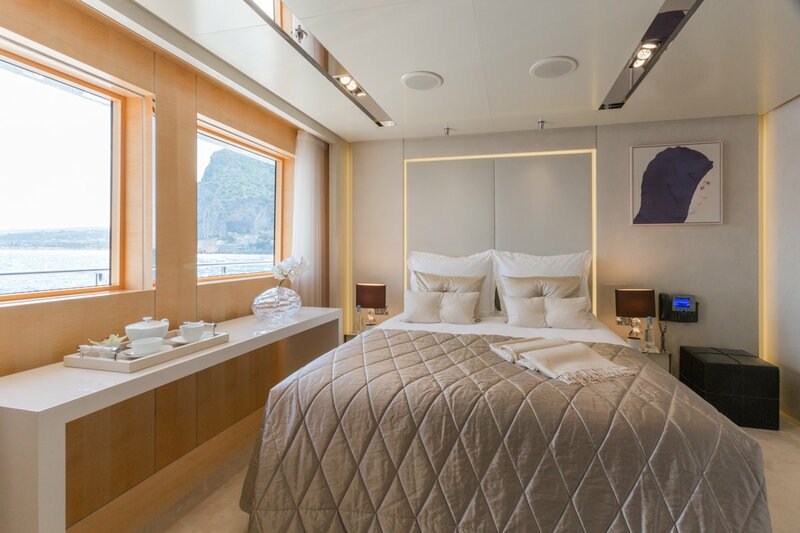 The master cabin benefits from spectacular views, excellent storage and exterior access on both port and starboard, leading to the upper foredeck, featuring a seating and sun pads. 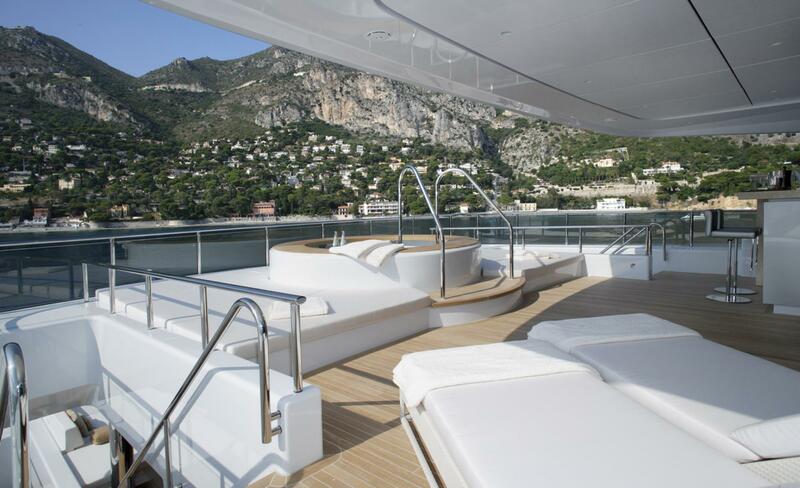 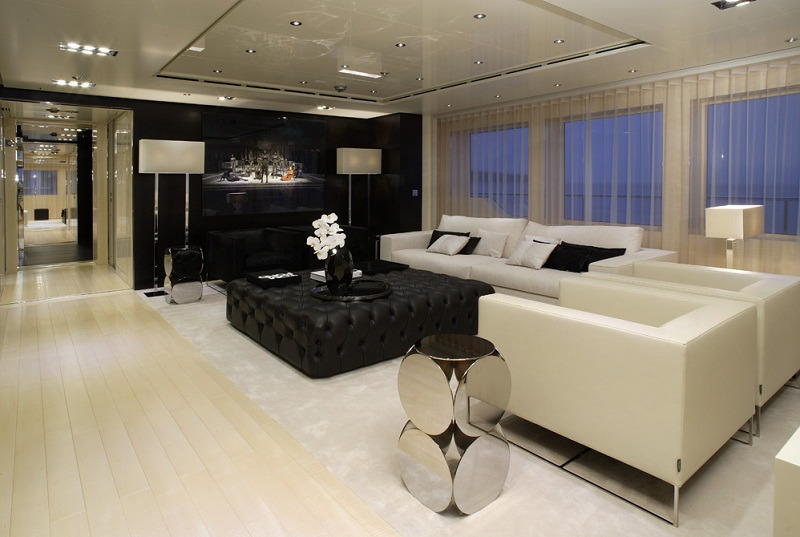 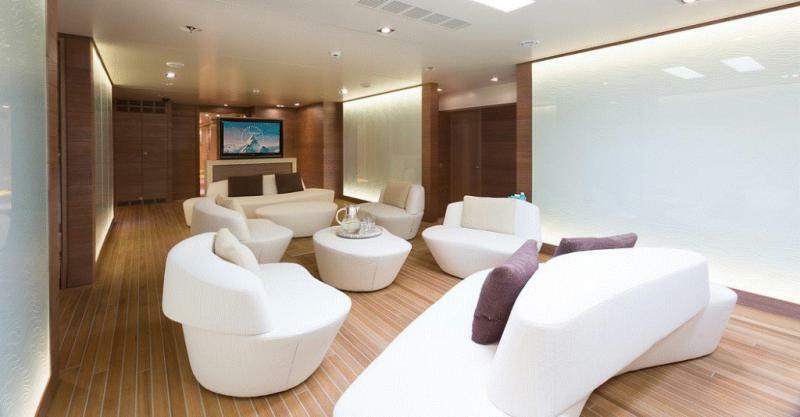 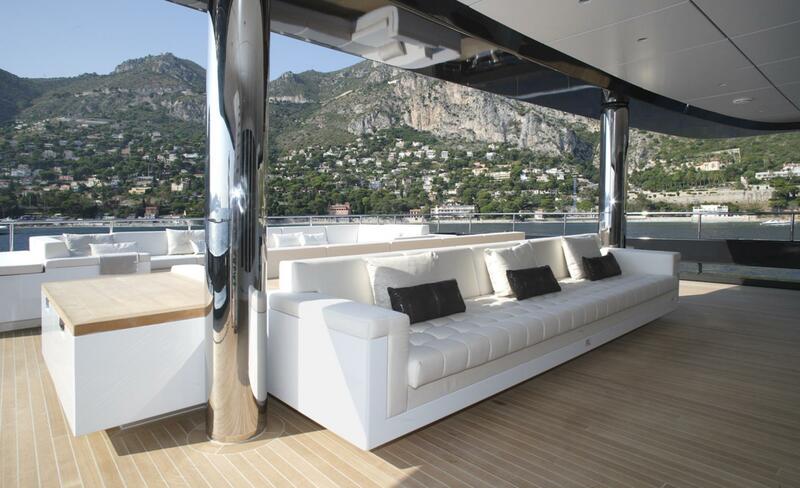 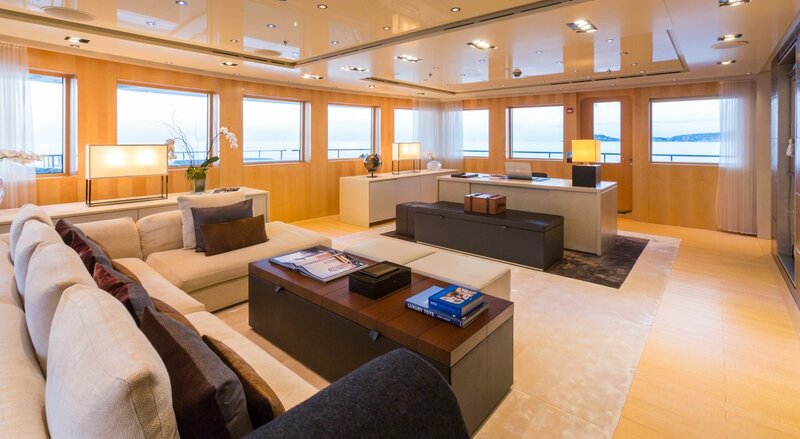 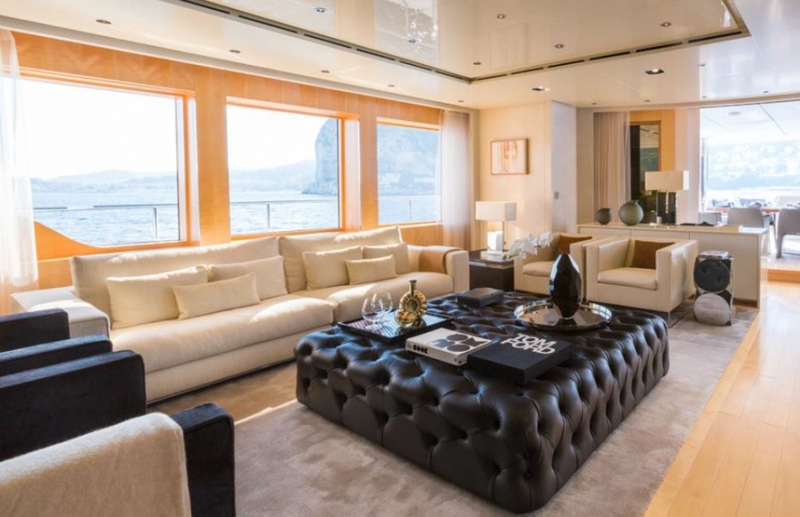 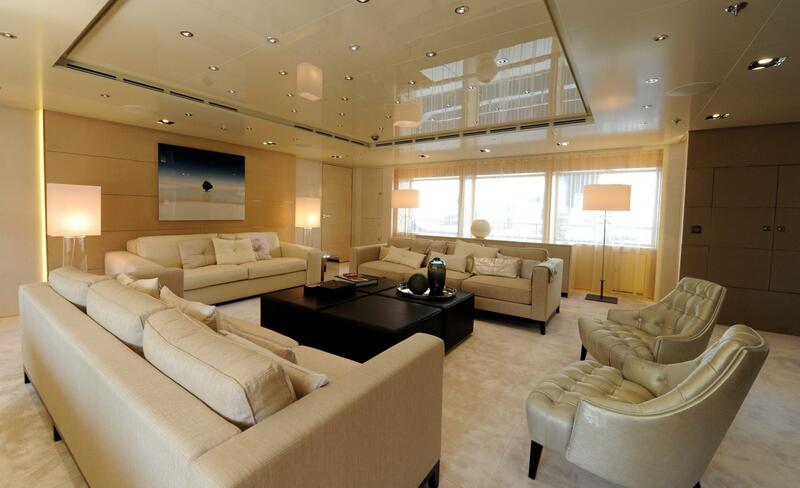 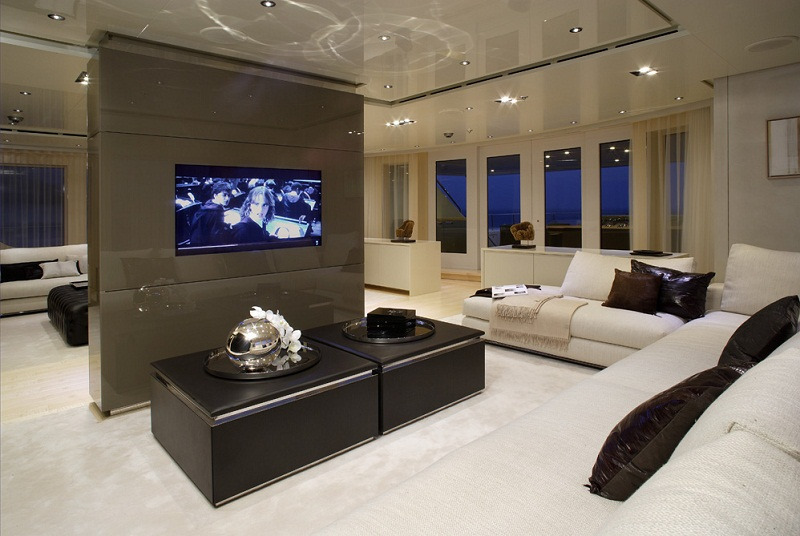 Her upper deck comprises a sky lounge, complete with sofas, beautiful leather ottoman and full entertainment systems. 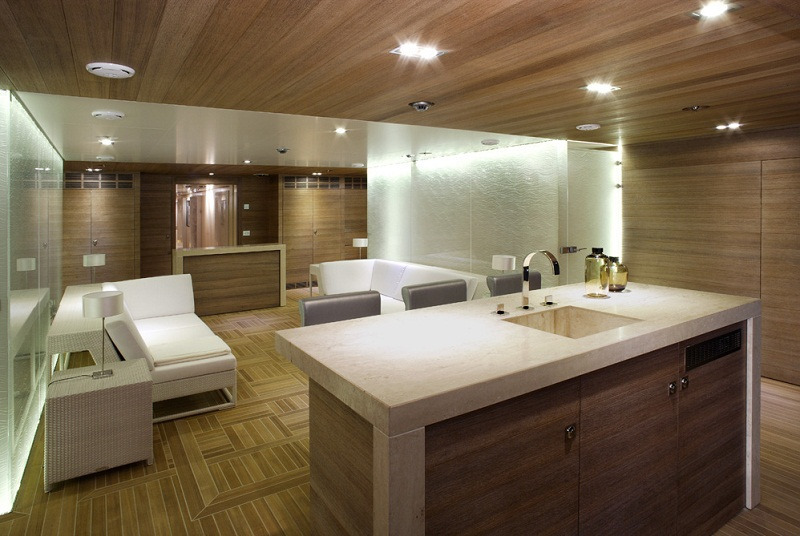 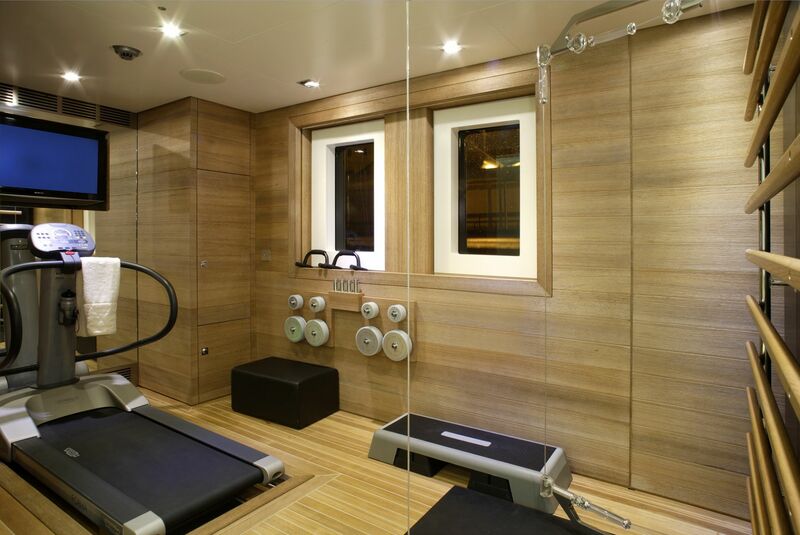 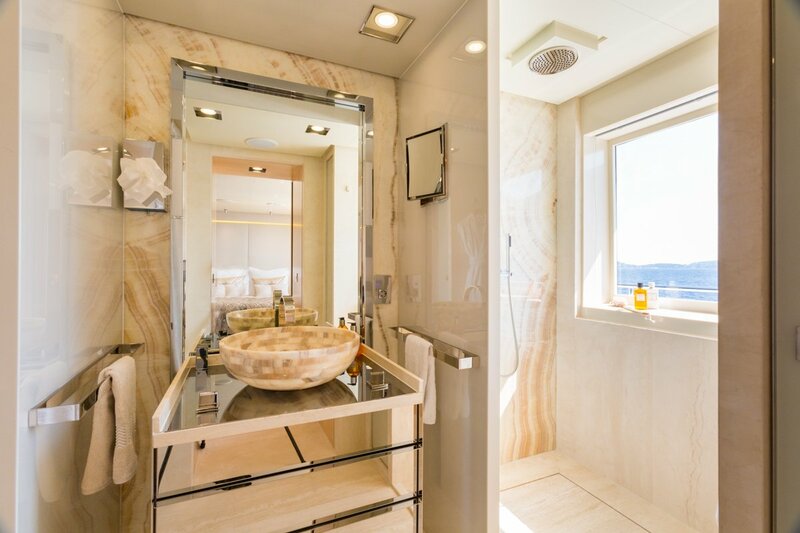 The VIP guest cabin is located on the upper deck forward of the sky lounge to starboard and features a generous shower room. 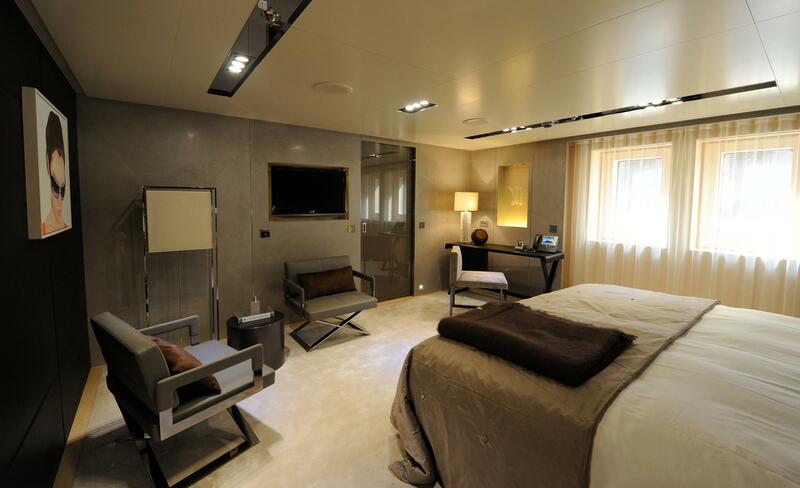 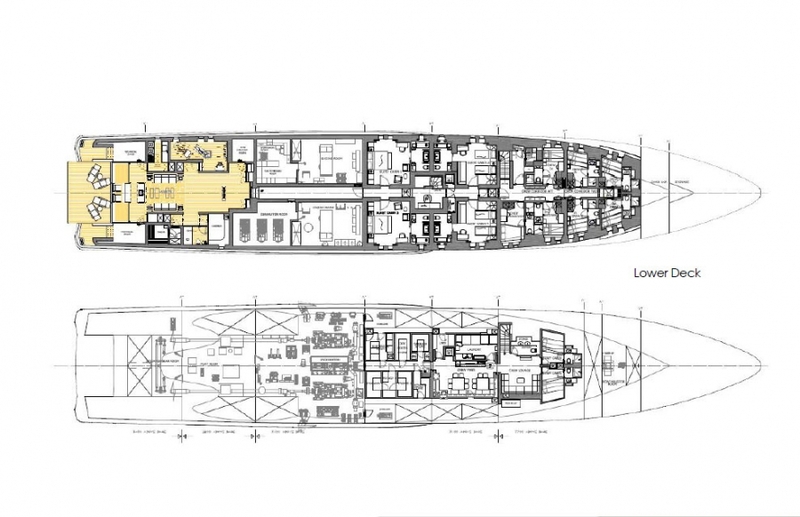 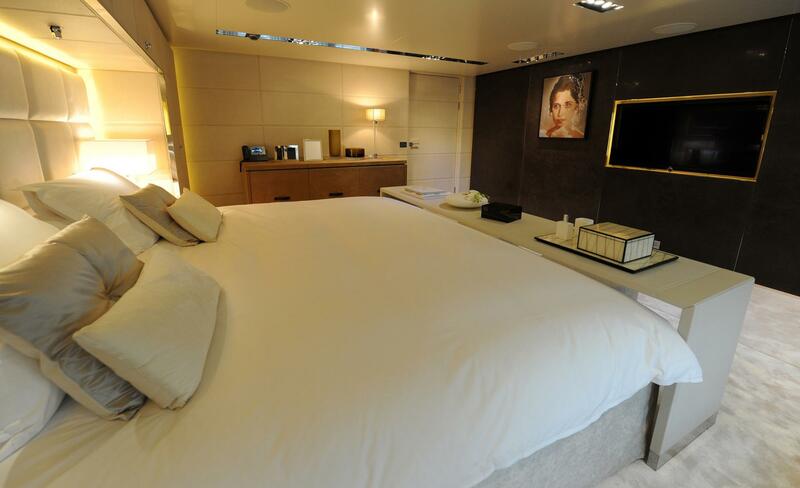 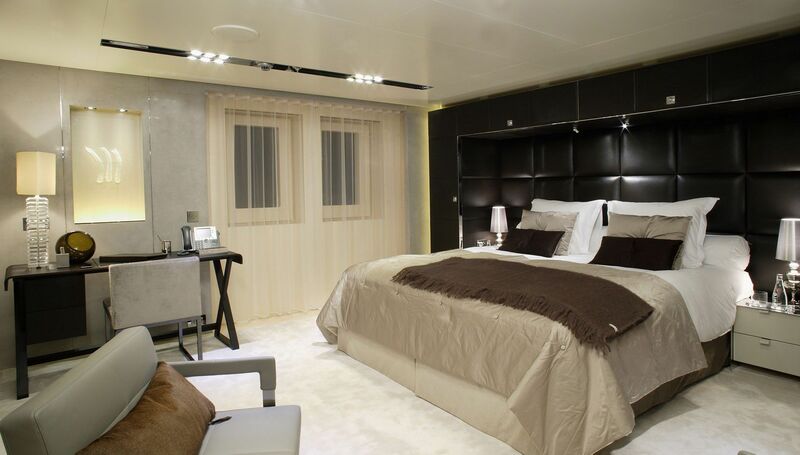 On the lower deck are two double cabins, as well as two twin cabins, all ensuite. 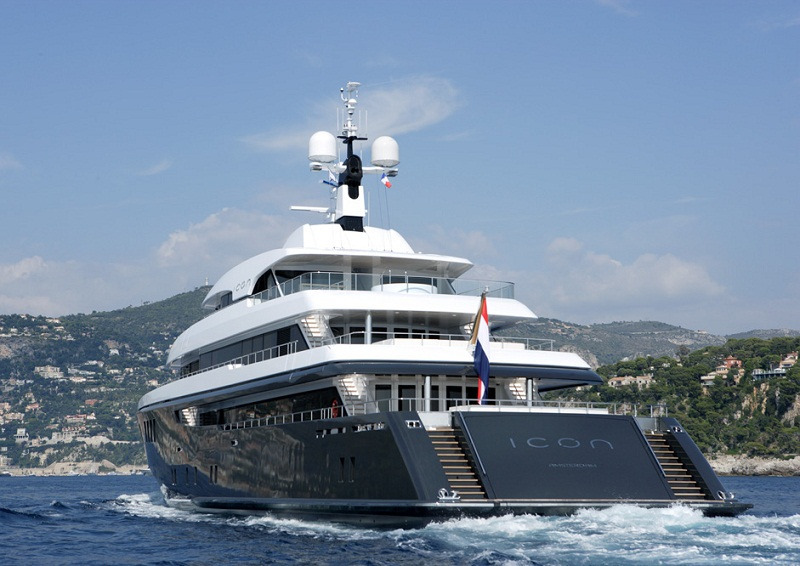 ICON has a fabulous beach club thanks to the extension she received; it includes a gym, hammam, sauna, wet bar, lounge, bathroom with shower, dive center, exterior sunloungers on the teak beach and direct access to the four lower deck cabins. 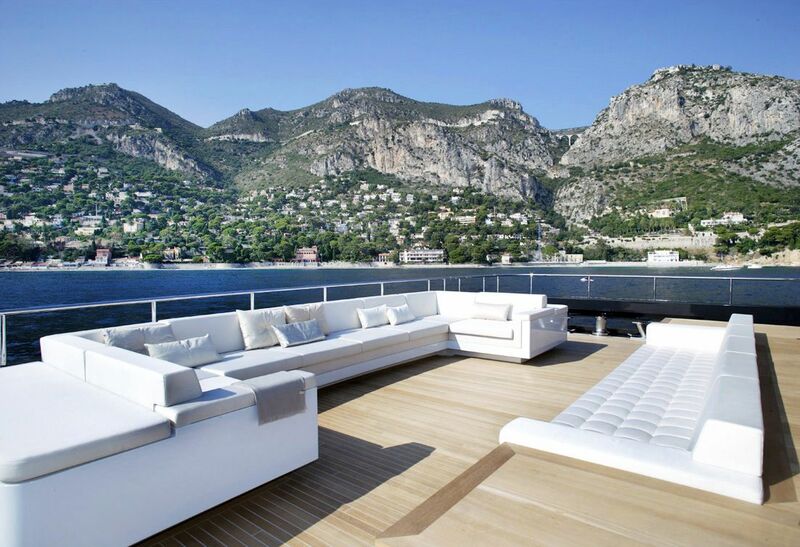 On deck guests will find there are plenty of areas to relax, entertain and be social, no matter the occasion. 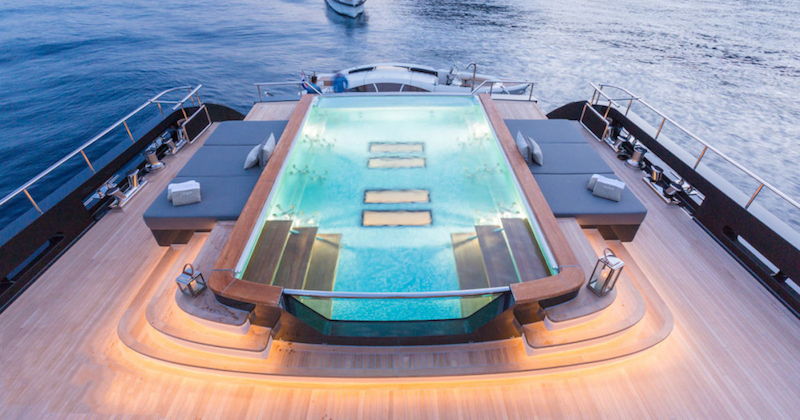 Her expansive teak beach and beach club, based on the lower deck, features an extended swim area, sun loungers, lounge, hammam, sauna, wet bar, and shower, it is the ideal area for incredible fun during the day, enjoying the multitude of water toys. 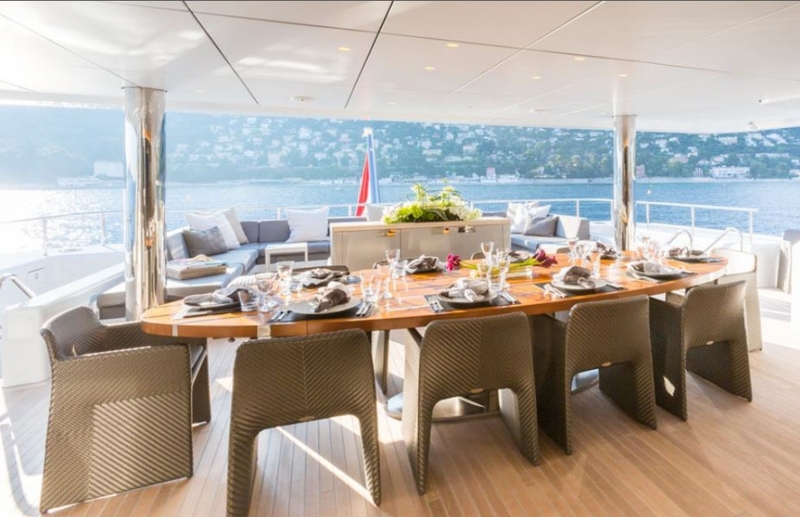 On the main deck, aft of the salon is large exterior aft deck, which features an alfresco dining area, sun pads, and large swimming pool. 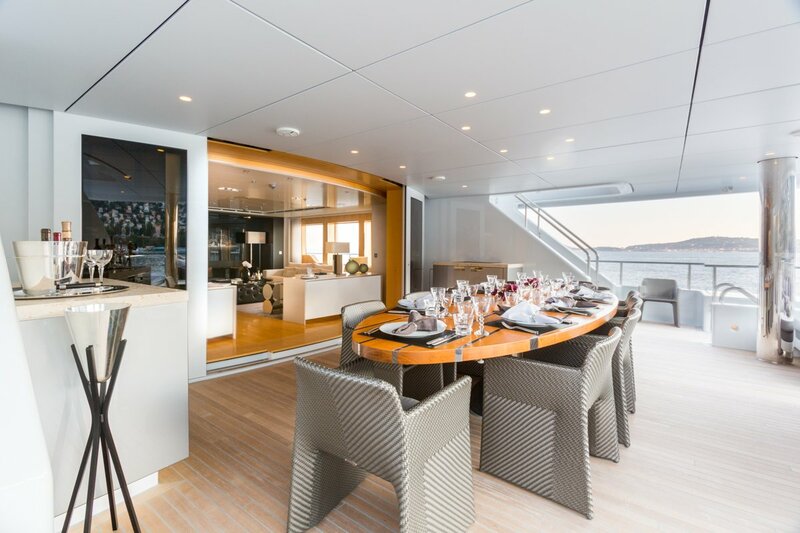 The upper deck has ample outside seating and a further alfresco dining table. 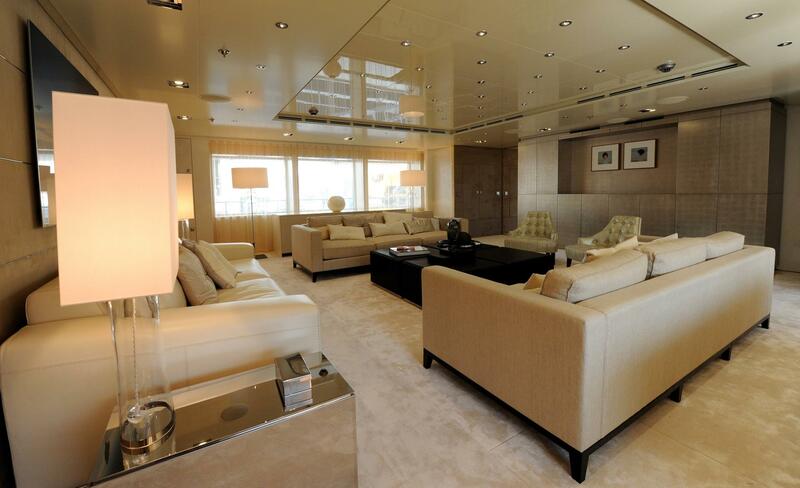 Her top deck boasts additional sun pads, seating, and deluxe Jacuzzi tub. 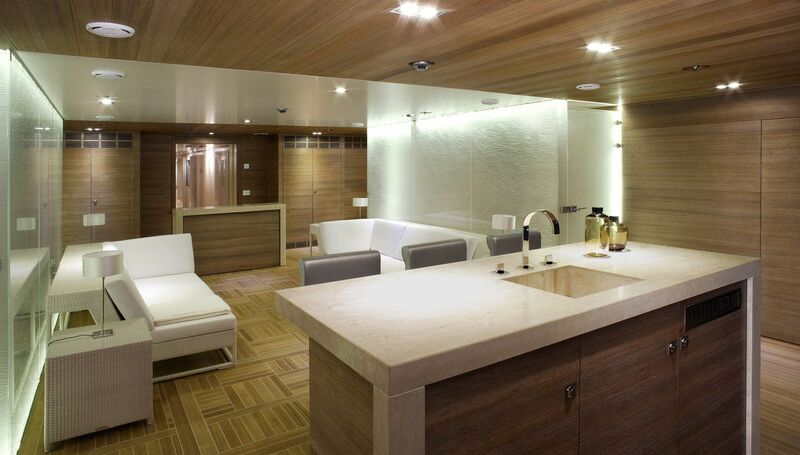 The owner’s suite has a private flight of stairs with direct access to an owner’s salon, which can be kept private or opened up to guests. 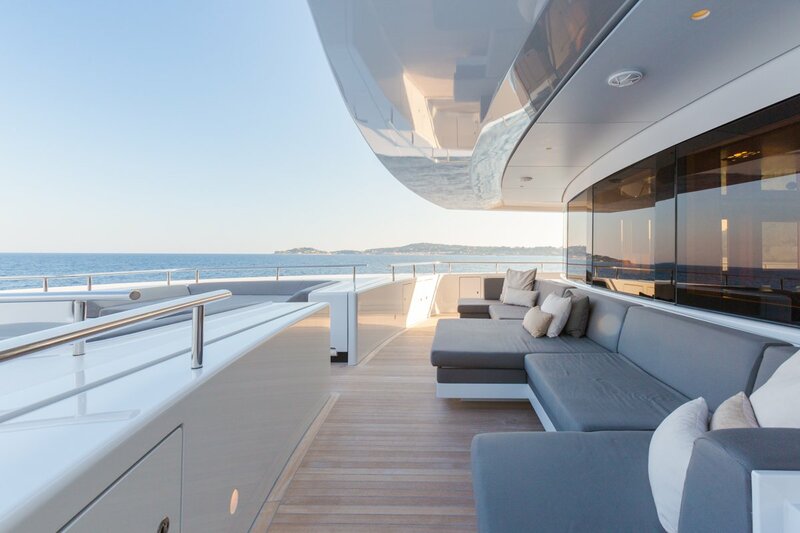 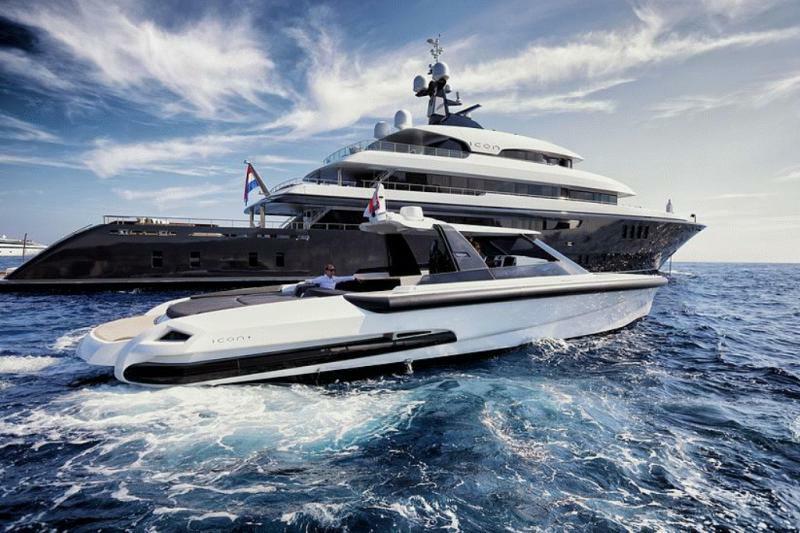 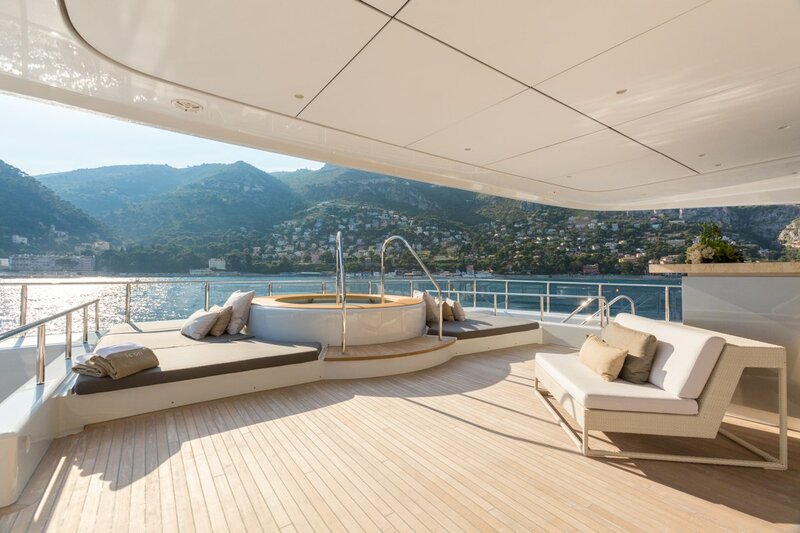 The architecture of the outside areas of the yacht helps give the exterior its “definitive proportions.” Dramatically staged overhangs with raked superstructure were carefully balanced in profile against the interior volumes, giving the yacht huge amounts of living area for its size. 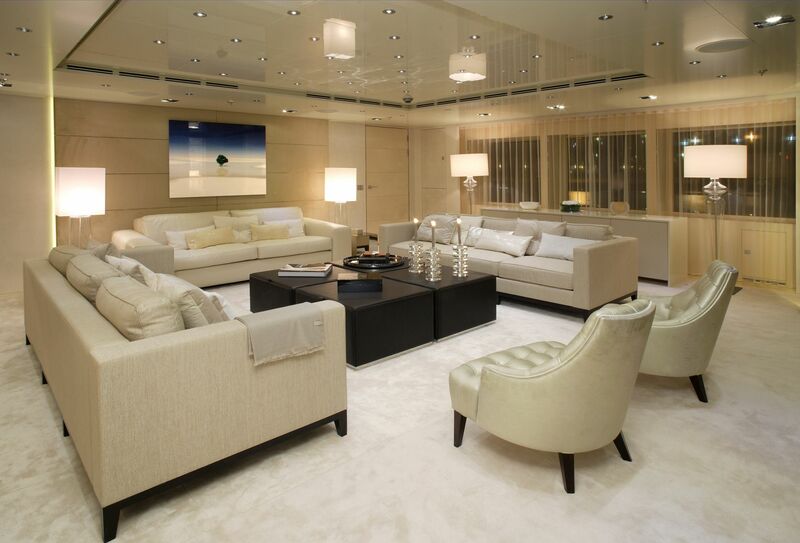 The interior styling features modern furnishing in soft tones for the relaxed and inviting atmosphere. 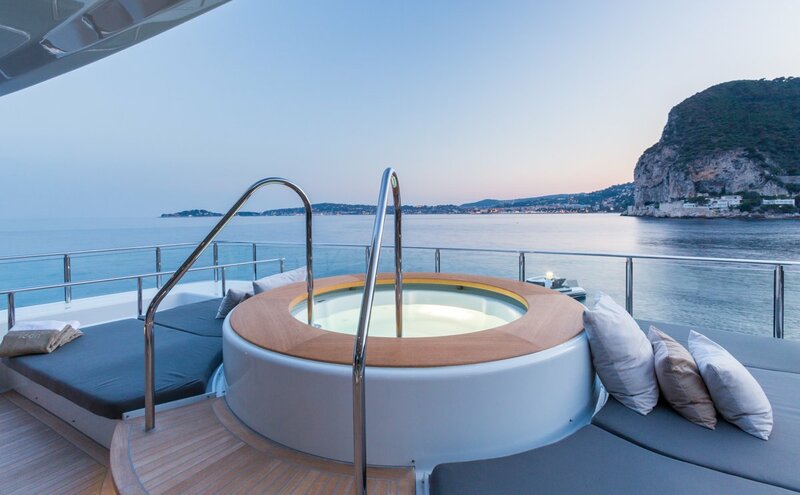 Thanks to the advanced technology used in the construction of the yacht, she can provide smooth cruising experience in any conditions, while stabilizers reduce roll motion and for ultimate comfort. 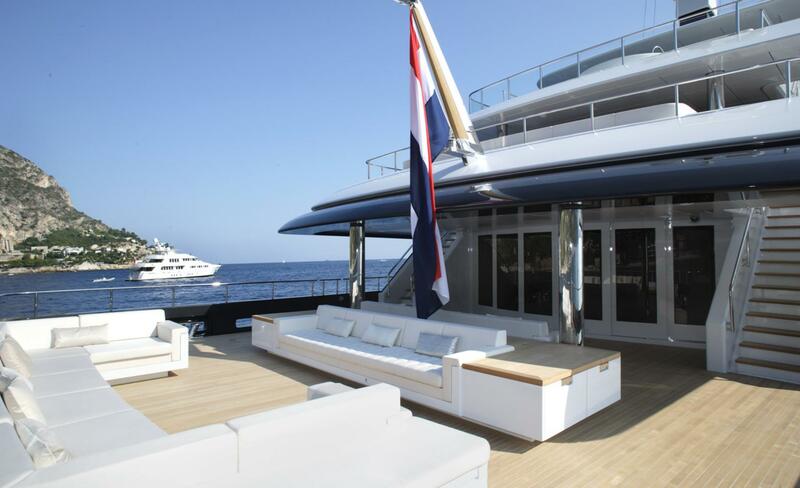 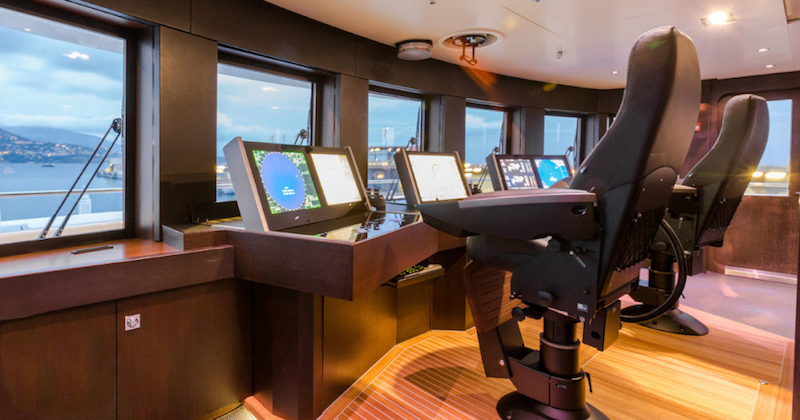 Superyacht ICON is a first Icon Yachts vessel ever launched by the shipyard. 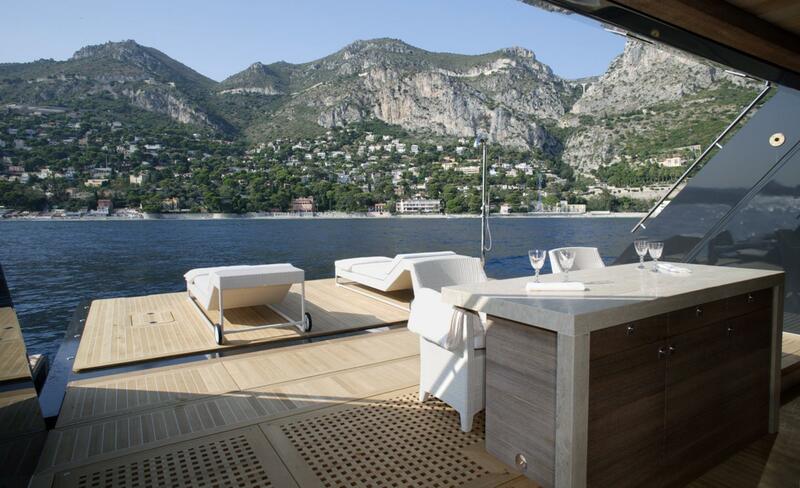 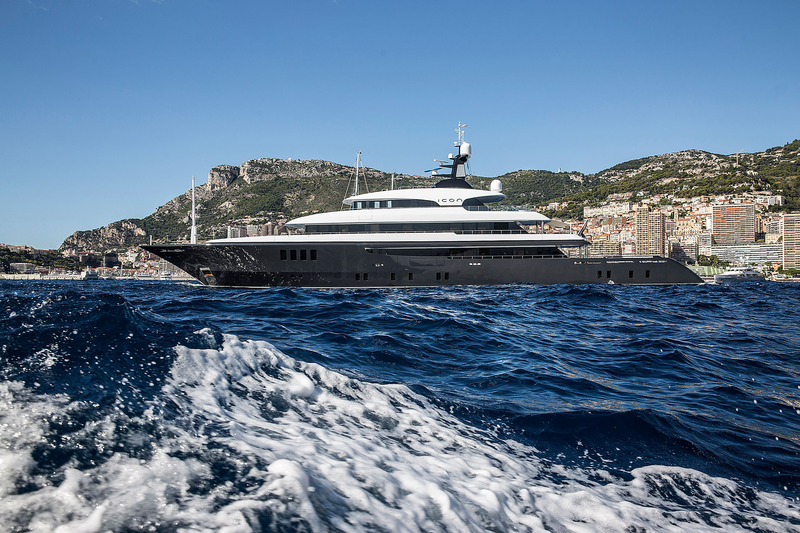 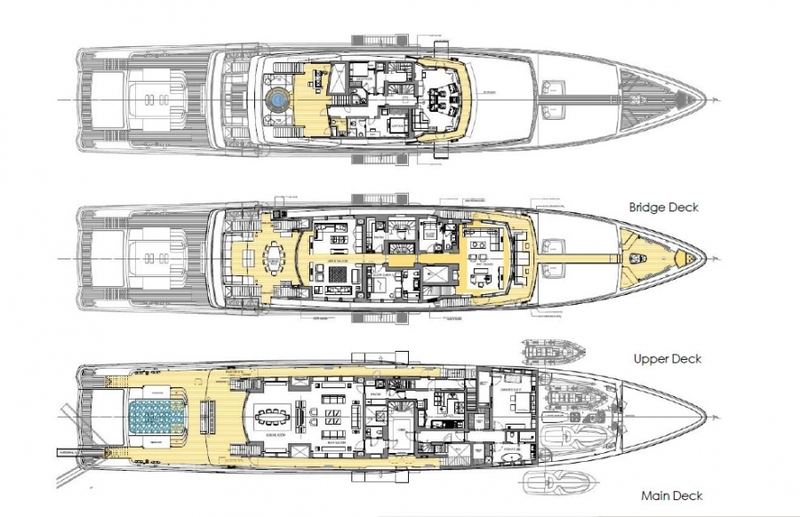 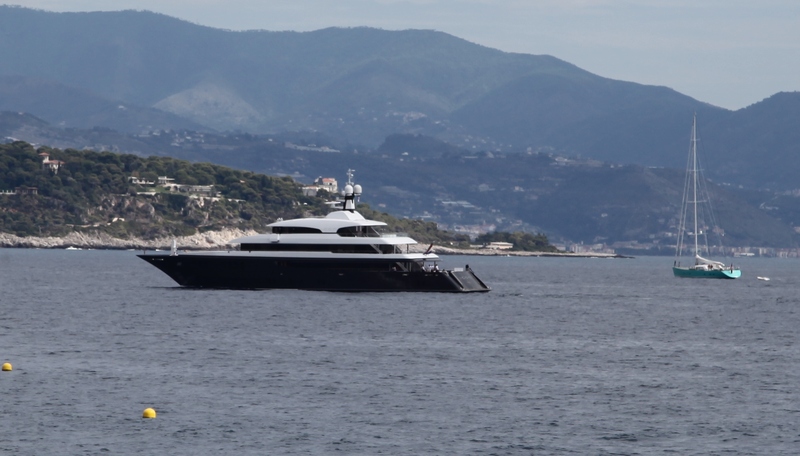 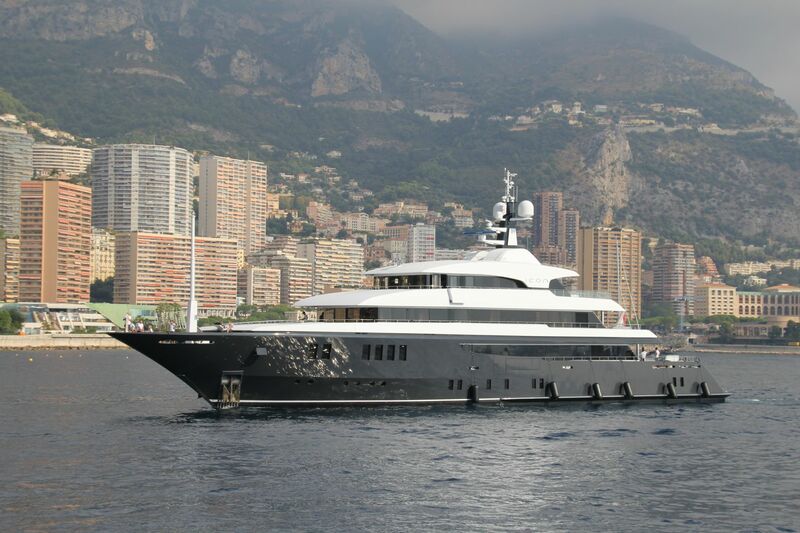 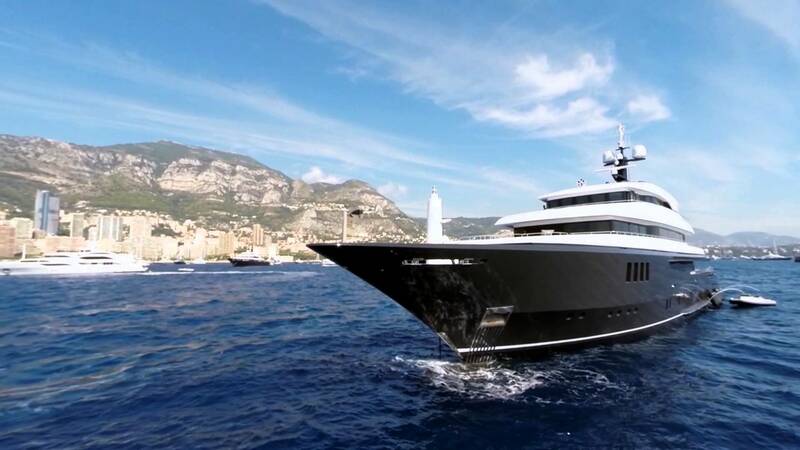 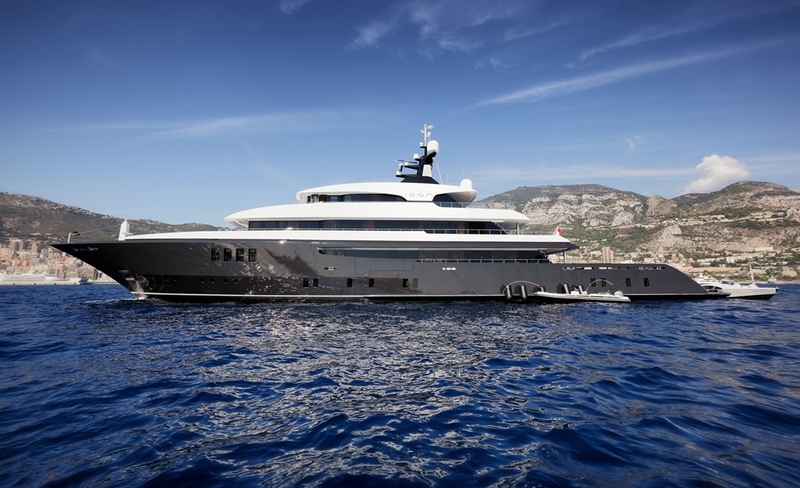 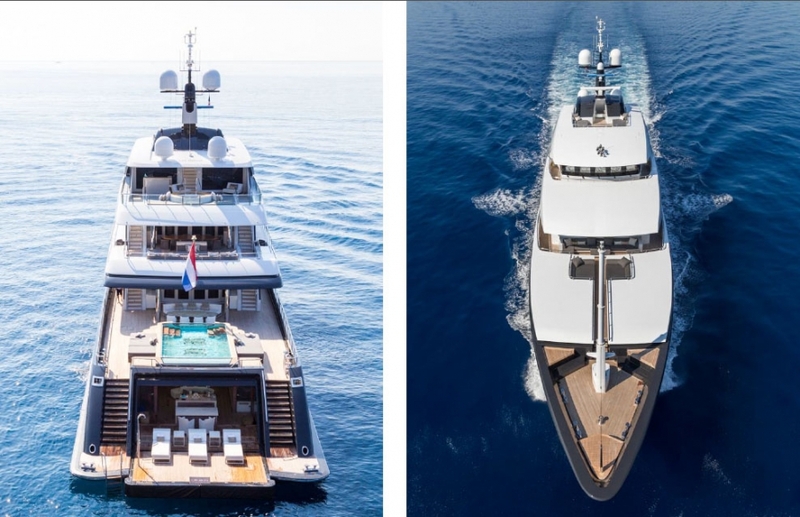 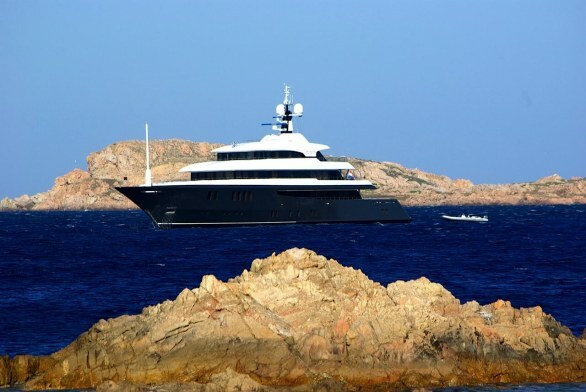 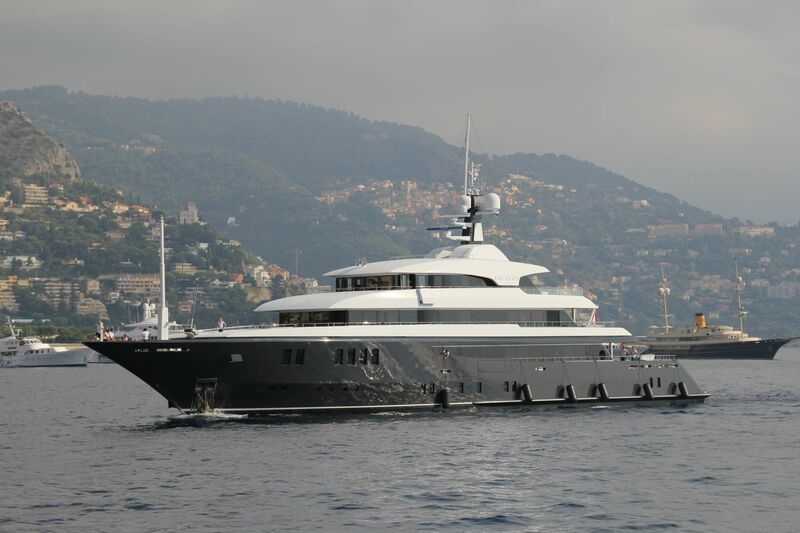 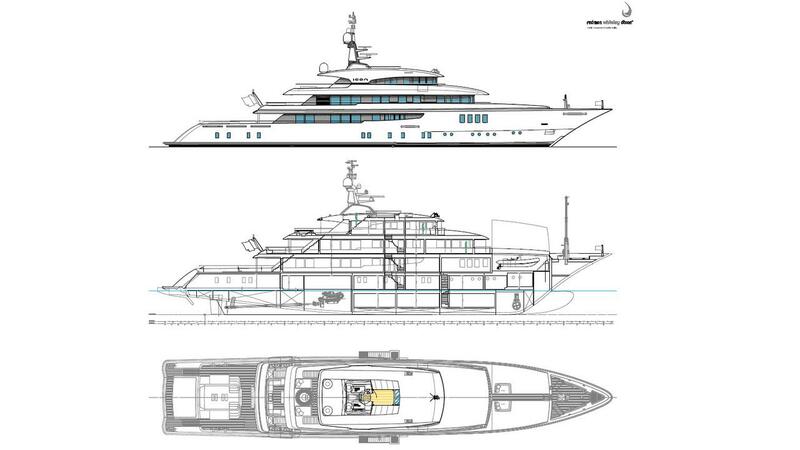 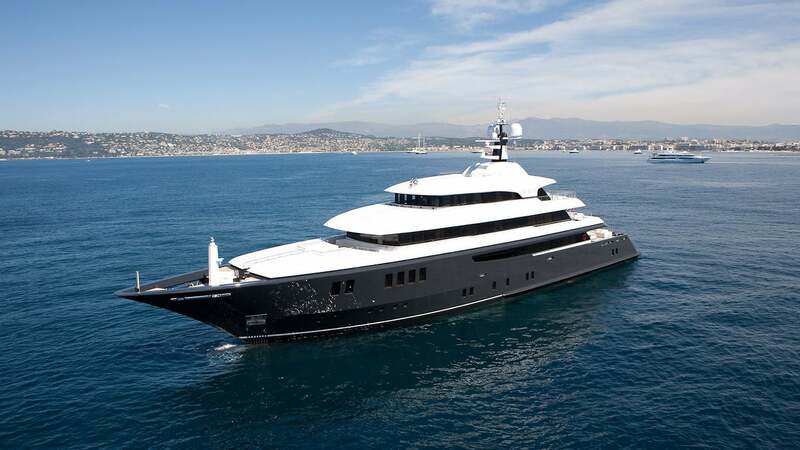 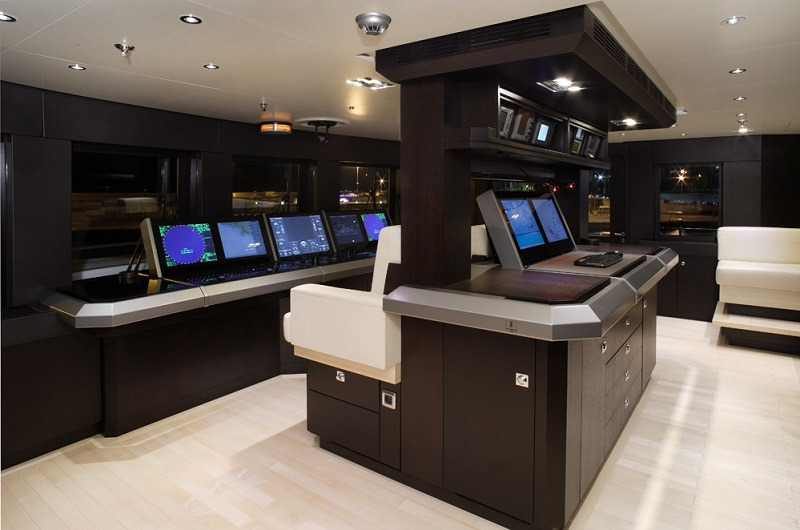 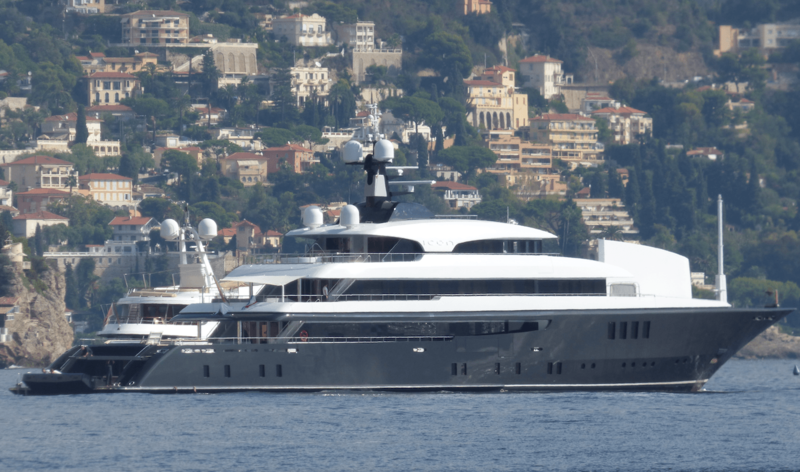 She boasts a very graceful steel hull built with the aluminum superstructure. 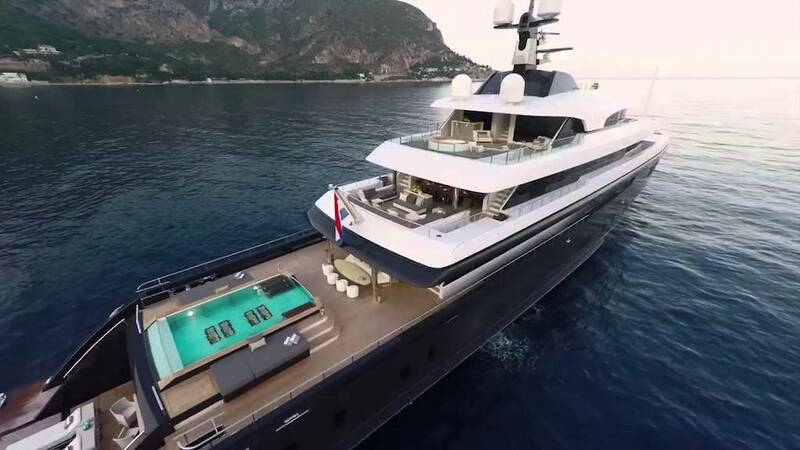 Her beam measures 11.40 meters and her draft is of 3.50 meters. 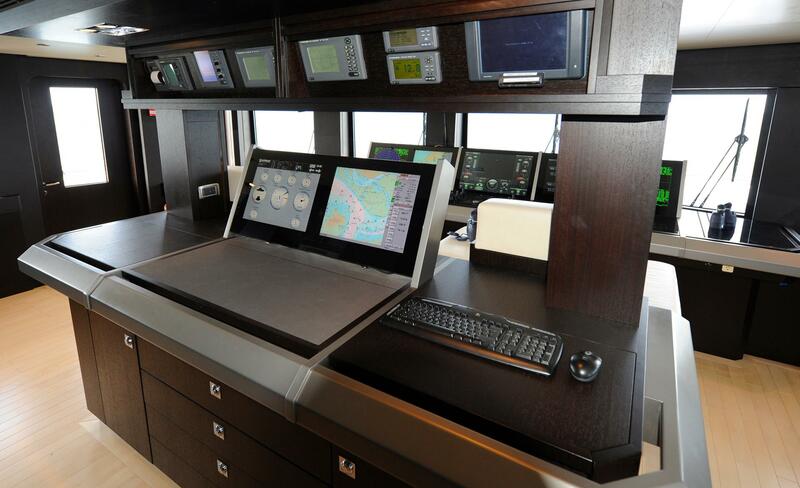 She reaches a maximum speed of 16 knots, thanks to her twin MTU engines. 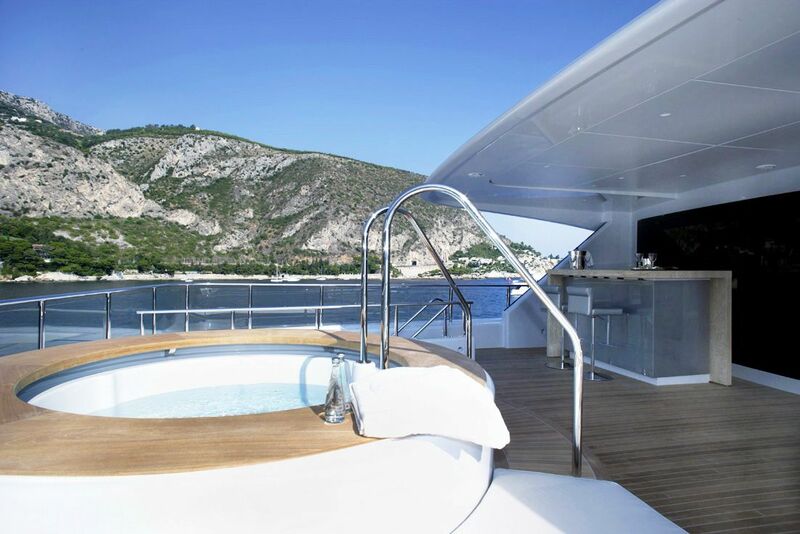 A cruising speed is 12 knots with an impressive range of 6,000 nautical miles. 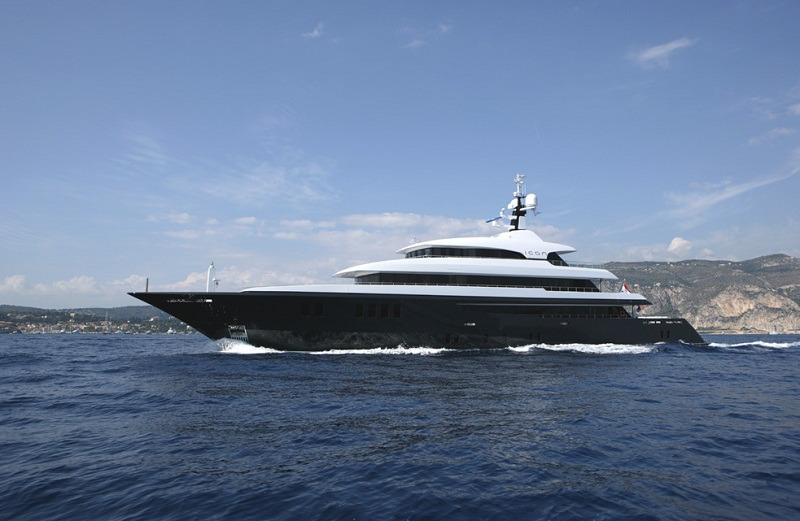 The capacity of her fuel tanks is of 160,000 liters. 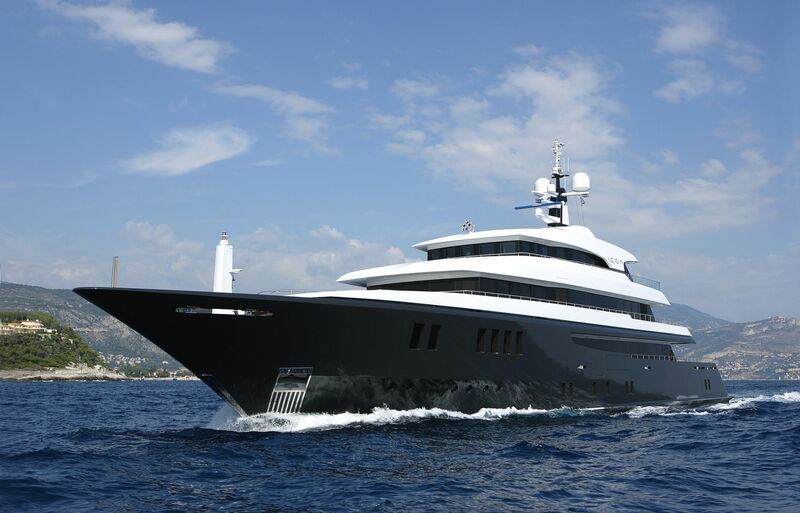 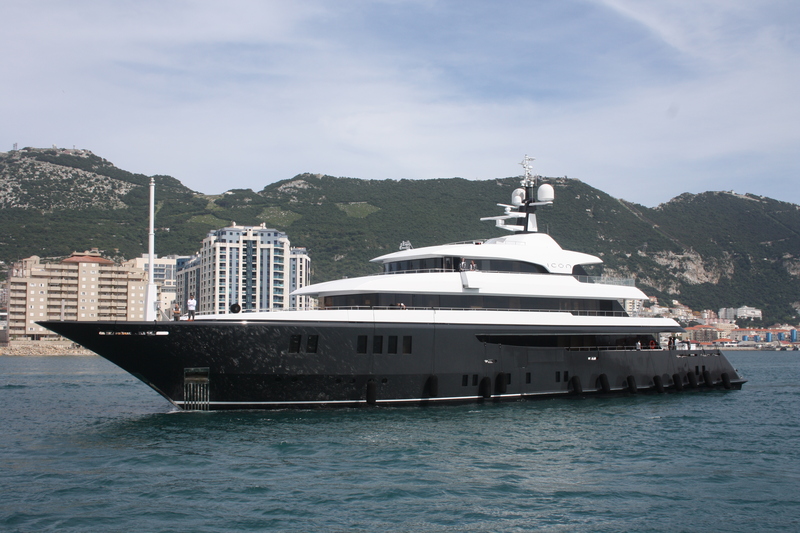 Motor Yacht ICON accommodates 12 charter guests in 6 luxurious guests cabins including 4 Doubles and 2 Twins. 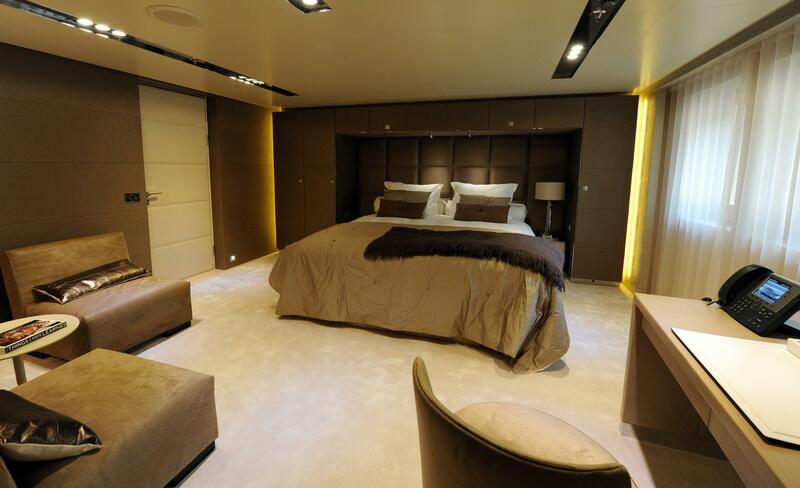 The master suite is spread over two levels and has private access to the lounge. 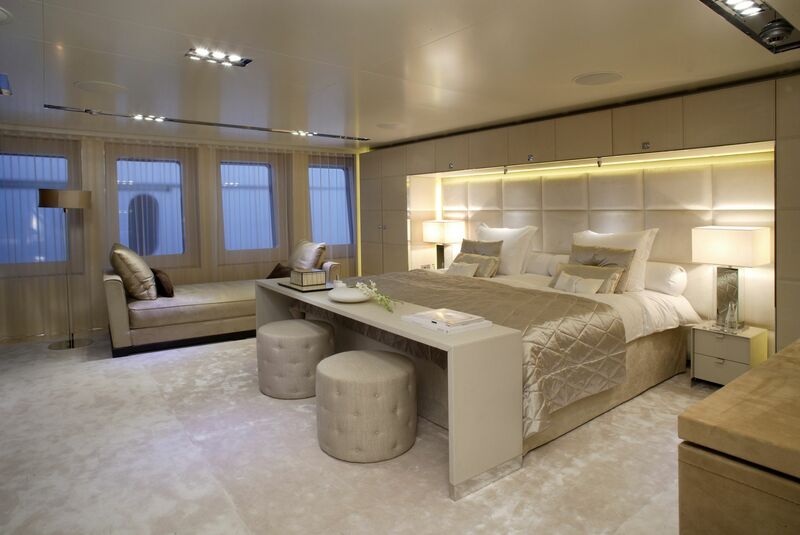 The VIP stateroom is located on the upper deck, which allows charter guests to enjoy the views and access the entertainment lounge. 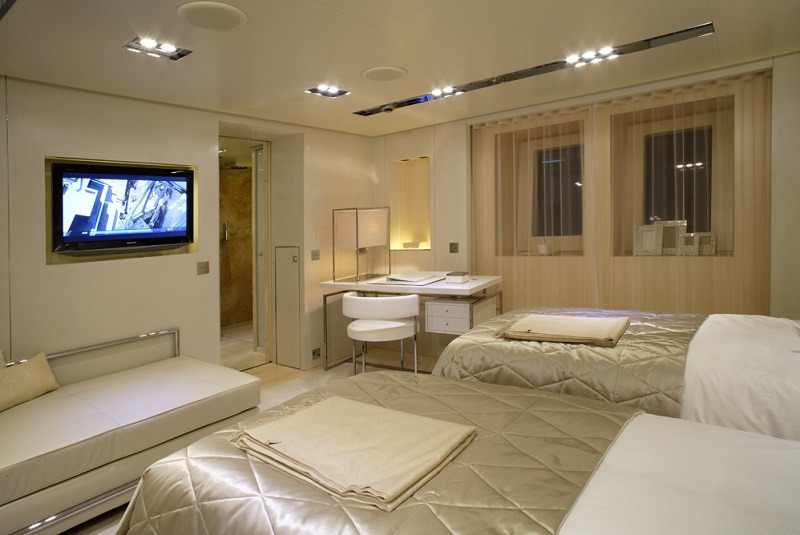 All cabins have ensuite bathrooms and individual entertainment systems. 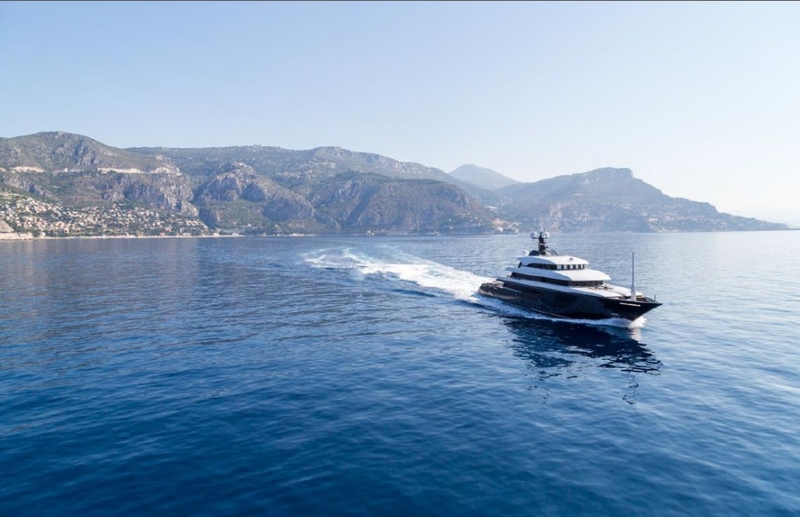 Motor Yacht ICON is equipped with the following tenders and toys: Long Island 26 feet custom tender with 315 pk inboard, Crew tender, 6.6 meter BGC Custom, 150 PK outboard, Jet ski’s, 2x Yamaha VX cruiser, Scuba gear, rendez-vous diving, Waterskis and water toys etc In the Gym: Powerplater, A running machine, Some free weights, Fixed resistance wall mounted divide for resistance training (Wellness machine) ICON is fully fitted with state of the art entertainment facilities throughout and full communications facilities including WIFI internet.